Motorola Verve Ones+ review | What Hi-Fi? You’ve seen headphones like the Motorola Verve Ones+ before, albeit at the cinema. The Avengers use them, James Bond, too. Or any film where a team goes forth on a heroic mission, making quips at each other through fantastically tiny earpieces. It wouldn’t be too much of a stretch to use them for music. A spot of Metallica would be very apt for Thor. That’s the dream: the ability to climb up trees and jump on bad guys while listening to sweet tunes, unencumbered by wires. The good news is that it’s not a fantasy. 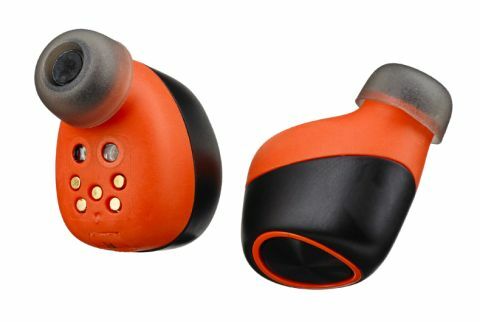 Wireless earbuds have been in development for a while now with Onkyo and Samsung also planning to launch truly wireless in-ears, but it is Motorola (or Binatone licensing the Motorola name) who have arrived first at What Hi-Fi? Towers with its Verve Ones+ headphones. You may have to temper your expectations of just how slick you’d look wearing these things, because they are not tiny. Only the very tip will disappear down your ear canal, and the rest of the bud will stick out by about 1cm. Then there’s the bright orange colour, which is hardly inconspicuous. Bottom line: think less espionage chic and more traffic-themed hearing aid. They are comfortable, though, and not much heavier than some of the larger wired earphones we’ve worn. Six pairs of rubbery tips (three with a double-flange design) are provided to ensure a snug fit, and once the Motorolas are suitably equipped, they didn’t fall out once in our testing (prolonged periods of running and jumping). The freedom wireless in-ears provide is also a revelation. No longer do you have to live in fear of having your ears yanked off by a zipper, or of your precious cans flying off your head during an enthusiastic headbang. What these wireless headphones bring is nothing short of total freedom of movement. It’s aspirational stuff. They're rugged, too. IP57 rating means they can be immersed in 1m of water for 30 minutes. We wouldn’t advise swimming with them, but a bit of rain or sweat won’t hurt. We like the case they come in, which also handles the charging. Every time you put the buds back in, they get a top-up. A fully-charged case is claimed to be good enough to provide charge for up to 12 hours, and our test results weren’t far off this. But using the Verve Ones+ is a bit of a mixed bag. Connecting to a smartphone or laptop is straightforward: just take the buds out of their case and they’ll immediately activate, searching for a nearby host. You should be connected in seconds. Things get considerably foggy once you try to use the headphones with the ‘Hubble Connect for VerveLife’ app though. The app adjusts the sound with various EQ presets, and toggles the ‘pass-through’ feature (for those who want to hear more of the outside world). There’s also a handy map to show your last registered location, in case you lose the buds. Where it all falls apart is the app’s insistence that you put the buds back into the case before any sort of communication takes place. The app also regularly fails to connect to the earphones, even when you do comply with those conditions. It’s frustrating, although at least you can cycle through the EQ presets by holding down a button on the buds themselves, which also handles play and pause functions. There are six presets, the most effective ones simply amplify bass or treble. We cycled through them and opted for the most balanced setting, but no tinkering will offset the inevitable disappointment that comes with the audio performance. The sound quality struggles even against the budget earbuds that come bundled with your phone. The sound is unclear and unsubtle. You get a vague idea of the instruments you’re hearing, but it never feels like insight. Tonal balance is fine, but there’s a hard edge towards the treble that makes them an unpleasant listen over long periods. Then there is the matter of dynamics – it’s rarely an impactful performance. We might dismiss these as exercise-only headphones, but surely even on the treadmill you’d prefer your beats tight and hard-hitting. Connectivity is another issue. The two buds are not created equal, for the left is the master and the right is the slave. Your phone connects to the left first, and the left then connects to the right. This is fine in theory, and we didn’t experience any latency issues between the buds, but we did regularly experience dropouts on the right ear bud. It seems the Bluetooth sometimes struggles to get through our skulls. It doesn’t happen often (once or twice per listening session) but it is enough to grate. The Motorola Verve Ones+ feel very much like a prototype. The core idea is a great one, and there is a genuine use for this sort of product. But these early efforts are a disappointment, so it’s back to the drawing board. Give us better sound and better connectivity and we’ll talk. Until then, we’d only recommend these if your only priority is movement.